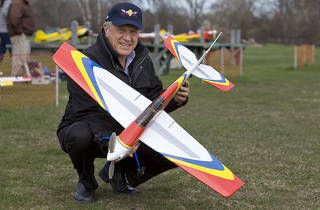 Radio-controlled airplane group meets at their own mini O’Hare in the woods. 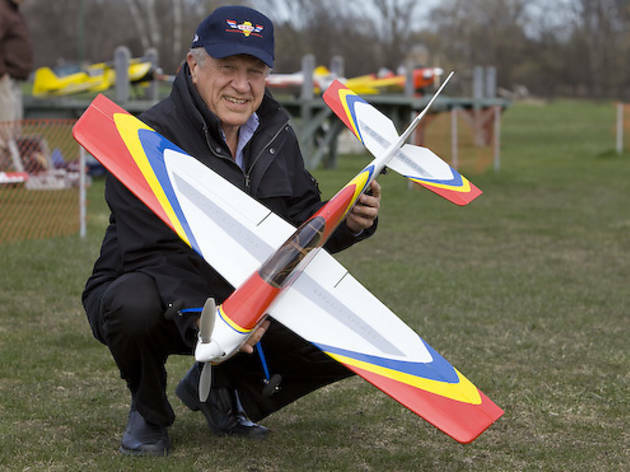 On nice days at Schiller Woods, a chunk of forest preserve a few miles east of O’Hare Airport’s runways, primary-colored model planes, some with wingspans over eight feet, soar through the cobalt sky. The pilots—beefy men in ball caps and aviator glasses—command these ersatz aircraft with joysticks on radio transmitter boxes. If you want to earn your wings with minimum nosedive risk, the veteran radio pilots are happy to show you the ropes, although the club’s website warns, “No impatient, know-it-all or reckless flyers will be tolerated.” Schier recommends dropping by the airfield midmorning or late afternoon on weekdays or anytime on a Saturday or Sunday and introducing yourself to the old-timers. While no loaner planes are available, the vets give tips on the best models for beginners and teach via a “buddy box” system that functions like a student-driver car.